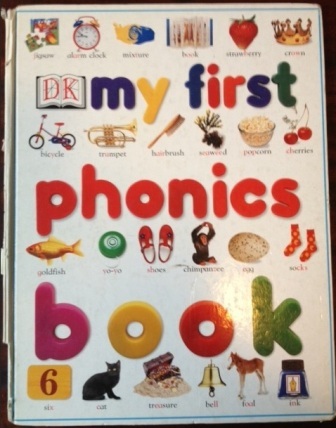 One of the resources I always have in my bag – in fact I have two battered copies, so that I can lend one out – is a DK picture book called “My First Phonics Book”. It looks a bit like any other “My First Words” book for little kids, except each page has pictures containing a particular speech sound, and highlights the spellings of that sound in red. It works through most of the sounds of spoken English, and it’s a nice-looking A3 hardback (well, mine looked nice till they got battered, but the best books always get worn and torn). I find this book very useful when talking to learners about sound-letter relationships. 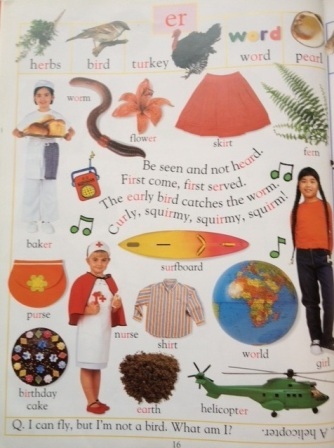 For example, when we’re studying the sound “er”, I can turn to the “er” page and find a heading made up of the following pictures and words: herbs, a bird, a turkey, a word spelled out in movable letters, and a pearl. Below this are more pictures and words with the “er” spelling picked out in red, plus a little verse containing “er” words, again with the “er” spellings in red. This is a great starting point for discussions of how to spell this word, which I follow up with a sorting activity in which multiple words containing the sound “er” are put into groups according to how this sound is spelt. I can’t find any other picture book which works from sounds to letters in a way that seeks to give learners maximum useful information designed to help them crack our complex spelling code (which is why I’ve made this free one, more on that in a minute). For the linguistic purists, this book is not 100% phonetically accurate. It treats the two “th” sounds (voiceless “th” as in “think” and voiced “th” as in “there”) as one sound (but hey, they’re spelt the same, so who really cares? ), and leaves out the sounds “you” as in “human”, “ear” as in “here”, “zh” as in “vision” and the unstressed vowel (schwa), plus it treats “aw”, “or”, “ks” and “kw” as separate sounds. “Aw” and “or” are different sounds in most dialects of American English, but not the English I speak. “Ks” and “kw” are both two sounds, not single sounds, even though we sometimes spell “ks” as though it was one sound with “x”, and we write “qu” not “kw” or “cw”. However, the main problem with My First Phonics Book is that it seems to be out of print :-(, though there are still secondhand copies for sale on the internet. It’s also still in the catalogues of some bookstores, though marked as “Not In Stock”. What’s wrong with most My First Words books? 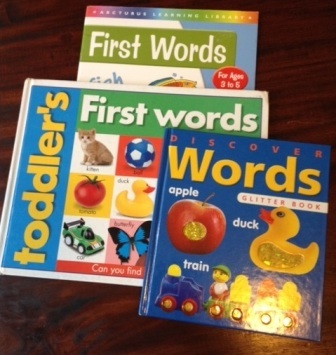 In stark contrast, there seem to be hundreds of whole-language-type “My First Words” type books for little kids, full of colourful photos and printed words organised by vocabulary group – toys, food, things in the bathroom, body parts, animals, etc etc – but providing no assistance whatsoever with sounds and letters. Some of the words in these books are short and spelt simply, but many others are long and complicated. I’ve got one such book in front of me now, and the words in it include “butterfly”, “sandwich”, “toothbrush” and “calculator”. How these are “first words” for a beginning reader quite escapes me. These books are even more likely to confuse learners about how written English works than the “a is for apple, aardvark, aeroplane, aioli, autumn” type books, as they make no attempt to associate sounds with letters. 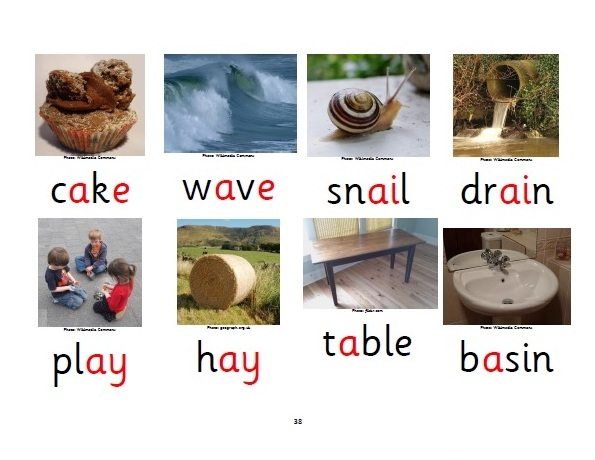 They thus encourage children to attempt to memorise written words as wholes, instead of breaking them up into spellings which represent sounds. I suggest you not buy or use them. To provide a currently-available alternative to these books, I’ve made up my own pdf picture book called “44 speech sounds, 200 spellings”. You can download it for free by clicking here. The book goes through all 44 sounds of English one by one and shows you firstly what the main spelling patterns are, and then some of the less common and rare spellings. It is designed for learners who know a bit about letters and sounds but are confused about how the system is organised, as well as for adults faced with questions from learners about how spelling works. I chose to include 200 spellings because it’s a nice round number, and allowed me to cover the main patterns and important words with unusual spellings, plus a few interesting and unusual ones (such as the “phth” in “phthalates”, because otherwise the spellings of the voiceless sound “th” are frankly boring, and I wanted to show that occasionally even consonants can be spelt with four letters). There are some words that don’t lend themselves to a picturebook format (how do you draw a picture of “the”?) and there are still a few unusual spellings in common words – such as the “chsi” in “fuchsia”, the “u” in the British English pronunciation of “lieutenant”, the “cht” in “yacht” and the “ault” in Renault – which I couldn’t squeeze in without extending this book beyond 60 pages. 60 pages is already a bit much if you’re trying to print it on an inkjet printer, but I’m hoping that lots of people will be able to either use this book as an e-book on their iPad or tablet computer, or just on an ordinary computer screen, or print it out on a colour photocopier or high-volume colour laser printer. If you are printing it out double-sided, make sure you choose the “Flip on short edge” option so it can be bound and read as a book. Stay tuned for the two other versions of this book I’m currently working on. 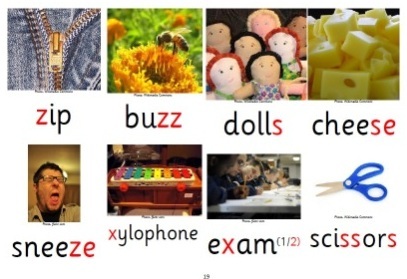 The first has just one spelling for each sound, and is for preschoolers/early Preps and other absolute beginners. The second one, which will take me a week or two given all my other commitments, has 44 sounds and 100 spellings, i.e. just the main spelling patterns for each sounds, not words with cruel and unusual spellings like “said”, “women” and “bury”. It’s meant to provoke thought and discussion on two key concepts needed to understand our spelling system well: 1. Each sound has more than one spelling, and 2. Some spellings are shared by more than one sound. This entry was posted in books, phonics activities, reviews, sound-letter links on May 13, 2013 by alison. Thanks Alison, this is a great book, you are so generous with your resources! Would love to borrow a copy. Well done and thank you, Alison, in producing your spelling picture book, which looks to be such a wonderfully helpful resource. I see that you thank the generosity of the contributors to your book for allowing their work to be shared but no less are thanks due to you for sharing the many free resources you provide. You are a shining example to all in the Open Educational Resources (OER) movement!